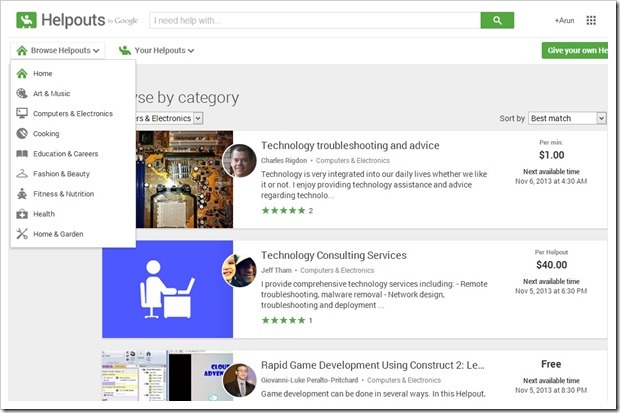 Google has just made an announcement of an interesting service called Helpouts. As the name suggest, the service allows people to help each other out on any subject online through live video (aka Google hangouts). Helpouts can be on any subject, be it about fixing your leaky pipe, or about cooking a particular dish or about learning a particular piece of software or even about learning a new language. The best part is that, it is not just about recorded videos that you see and try and understand – It is about an actual expert who is sitting on the other end and giving you help to the exact problem that you may have. Helpouts is for everyone – While you may need help in some subject, you are an expert on other. You can list yourself and offer your “help” either for free or for a price. And everything is done through Google hangouts. Once inside the helpout, the person who is giving the help can do much more than just talk – they can share computer screen to show something on the computer or collaboratively edit a presentation and even record the Helpout for referencing at later stage. And, users who are taking “help” can rate how their experience was on the helpout, ensuring that others also know the quality of a particular Helpout! There is no doubt that Google has launched this to popularize their Google+ Hangouts service, which is already widely used for various reasons. But with helpouts getting launched, usage of hangouts may swell to a very large extent. On a personal level, I think helpouts will be a big success. First off, because it’s Google, it will obviously have a very wide coverage. Secondly, it is a service that will find many takers, simply because from the comforts of your home you can get precise help from an expert. In many ways, I think Helpouts has a potential to be a much bigger and better interactive Wikipedia on everything. Give Google Helpouts it a try and let us know what you feel!